Streetcars disappeared from Detroit decades ago, but a group of prominent business and philanthropic leaders are trying to build a modern version of the once-popular transit system. Auto racing legend Roger Penske, Quicken Loans founder Dan Gilbert, the Kresge Foundation and others have raised nearly $100 million for a proposed streetcar system running along Woodward Avenue from Congress Street in downtown to New Center. Originally proposed as a light rail system connecting Detroit to the suburbs, the M-1 Rail project was downsized to a 3.4-mile-long streetcar system after Gov. Rick Snyder and U.S. Transportation Secretary Ray LaHood threw their support behind a high-speed bus system. The M-1 project (M-1 is the state highway designation for Woodward Avenue) is projected to cost $137 million. Matt Cullen, a former General Motors Co. executive who is CEO of M-1 Rail, spoke with Bridge about the project. Bridge: The Department of Transportation has, for now, turned down your request for $25 million in funding for the M-1 Rail plan over concerns about how the operation of the line will be paid for long term. How do you plan to convince the feds that this is a viable project? A: They said, "We don’t have a TIGER (Transportation Investment Generating Economic Recovery) grant for you, but there’s another $25 million in our budget waiting for you when we get the information we need." We’re comfortable with that. They want more detail about the project in the next 60 days. We were dead in the water 90 days ago, but we’ve proven so far that we can do this. The questions are who is going to operate this; who gets the money from the fare box? They’ve given us 60 days to answer them. 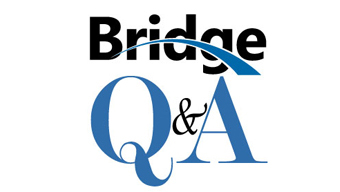 Bridge: What happens if you’re not successful in obtaining federal funds? A: We’re certainly optimistic. There’s no real contingency plan at this point. It’s possible, but not desirable, to raise more money from our partners. The business and philanthropic communities support the project. If we’re going to do this, it’s important to have all the different partners (including the federal government) participating. Bridge: Do you need a regional transit authority in place before you can construct the line? A: I think we all need the regional transit authority. Transportation in Southeast Michigan has been balkanized for too long with D-DOT and SMART and all these systems that don’t interact with each other in a cohesive way. We want the (Regional Transit Authority) in place sooner rather than later. But I don’t think it makes sense for us to wait. M-1 is ready to move today. We can go forward and be a catalyst for an RTA. We can operate for 10 years before the RTA or another entity take over the operation. We want that to happen sooner rather than later. Bridge: Are you considering a private operator for the line? A: Yes. M-1 obviously is not a transit company. We don’t want to build up to become a transit operator. We’re looking to select the best private operator (if the RTA doesn’t materialize). It’s like hiring Marriott to run your hotel. It’s not an overly complicated process. Bridge: Light rail has been viewed in other cities as not just for moving people around, but as a key component for economic development. Do you see it that way as well? A: We surely do. The people who are involved in this project are big fans of transit, but the real focus is on economic development. They see Midtown and downtown Detroit as a great environment to live, work and play. Bridge: What kind of development projects do you envision occurring along the route? A: A lot has started already with more people living in the area. Residential, research and retail are among the activities we’ll see develop along the line. Bridge: Do you see M-1 as part of a larger regional transportation system in southeast Michigan? A: Yes. The RTA really is a foundational element. A rapid bus system has been proposed for Southeast Michigan. We think that’s the right answer. Obviously that needs to tie into the Woodward Avenue corridor. Many people are skeptical about mass transit, especially in Michigan, the home of the domestic auto industry. Why will the M-1 be successful? It’s really not hard to look around the country, benchmark other systems and see that they’ve been universally successful. At times, people say the fare box revenues aren’t enough to offset the costs. But we’re confident the ridership will be there. We look at this as a way of revitalizing the city. If you wanted to pick one city for our system to emulate, it would be Portland. What they have is consistent with what we want to put in here. It’s easy to benchmark other cities’ transportation systems against ours because we’re the only city that doesn’t have one. Bridge: Overall, what will this project mean for Detroit and Southeast Michigan? A: It’s an economic development driver. It’s a bona fide transit system. It connects the most populated city with the rest of the region. It connects us to the Amtrak station in New Center. Ultimately there will be a passenger rail link to Metro Airport. These are important components of what young folks want when they’re deciding where they want to live when they graduate from college. They’re looking for reliable public transportation. Bridge: You mentioned earlier that rider fares won’t cover the costs of the system. How will you ensure that the system is financially viable? A: The fare box doesn’t fully support any transit operating system in the country. In this instance, we have put together strong private support, and we’re looking at things such as selling naming rights to the system so we’ll have a balanced budget. Bridge: When should we look for the M-1 line to be operational? A: We hope to get the (Federal Transit Authority) to sign off in 60 days. The environmental review has begun. We hope to begin construction next year and complete the line in two years. It’s been an arduous process at times, but we’re getting near the finish line. Until Detroit recognizes that it an integral part of the inter urban community and not an island unto itself. The M1 project will be jeopardy. DDOT and SMART must reach an agreement to merge and form a single entity serving Wayne, Oakland, Macomb and Washtenaw counties with common board. YEA In 20110 congressmen John DINGELL iussed $ 200 MILLION to Michigan , the Michigan house voted HB6484 and iussed a Bond of $ 100 Million..The MITRAIN /semcog.org/AADD.aspx iussed the NEWS in fall 201 YOU/ME will rides the TRAIN from AnnArbor to detroit with stops in Ypsilanti. DTW airport etc. to the THANKSGIVING PARADE ..................WHY WASTE INFORMATION printed and false .etc etc..THEY CANNOT EVEN KEEP THE LIGHTS ON in DETROIT?MUCHLESS keep the BUSSES runnig! WE allready have one disater TRAIN running in detroit in circles that is loosing moneies everday.AT least keep the IT of the TRACKS?Lose so they can go/drive where the peole need it . LOK into THE GOLDEN SPIKE"! It has been in the works for over 30 YEARS. Going from AnnArbor to Brighton/Howell. HOW much TAXPAYERS money has been spend , for reaserch and How many poeple made a LIVING off tHAT Project? really like to know!